MHA periodically produces statistical analysis of the quality improvement efforts now underway across the commonwealth. 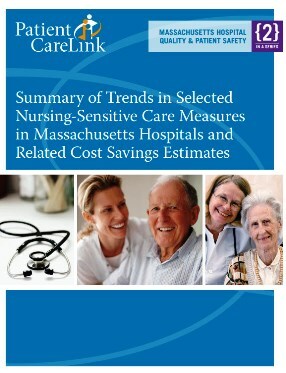 Reports to date have focused on Massachusetts hospital trends in improving care; an analysis of nurse staffing based on the Worked Hours Per Patient Day metric; and costs savings associated with improvements in certain nursing-sensitive measures. Check back here for new MHA reports. 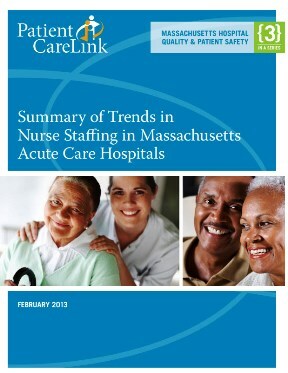 Hospital-specific nurse staffing data for nearly all hospitals across Massachusetts are reported at the PatientCareLink website. The staffing plans and reports are developed using the metric of Worked Hours Per Patient Day (WHPPD). This is the number of direct care hours planned for a patient from patient care team members in a 24-hour period. For all Massachusetts adult medical, surgical, and medical/surgical combined units in acute care hospitals participating in PatientCareLink, the median hospital actual worked hours per patient day for all direct caregivers grew from 8.01 in 2006 to 8.76 2011, an increase of 9.36%. For the same time period, the median hospital actual worked hours per patient day for registered nurses (RNs) increased by 7.9%, from 5.57 worked hours per patient day to 6.01. The Massachusetts Health & Hospital Association (MHA) and the Organization of Nurse Leaders of MA , RI, NH & CT (ONL) have organized hospitals throughout the state in a voluntary reporting program to reduce adult pressure ulcer prevalence, patient falls, and falls with injury in hospitals. Under PatientCareLink, acute care and specialty hospitals report quarterly data on these events following the measures identified in the National Quality Forum's "National Voluntary Consensus Standards for Nursing-Sensitive Care: An Initial Performance Measure Set" and further specified by The Joint Commission. The hospital-specific measure data extends back from June 2010 for more than three years and for the most recent reporting period for each hospital may be viewed on PatientCareLink. These data have been used as a foundation for collaborative efforts among hospitals to implement improvement programs and share best practices to reduce pressure ulcers and falls in hospitals. 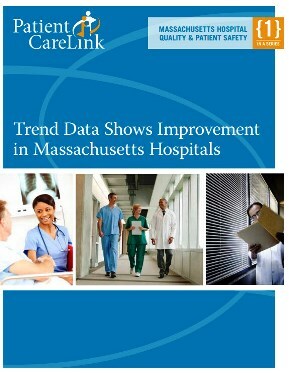 Trend data for the first five years of the nation's preeminent hospital quality measurement program demonstrates consistent and pronounced care improvement in Massachusetts acute care hospitals. Patients are receiving the treatments known to produce the best results more often and more reliably each year. Massachusetts hospital performance has exceeded national norms during the period, even as national performance has improved along a similar path. As the demand for more hospital performance measurement increases, existing data offer lessons for policy makers in the design of measurement and public reporting initiatives.